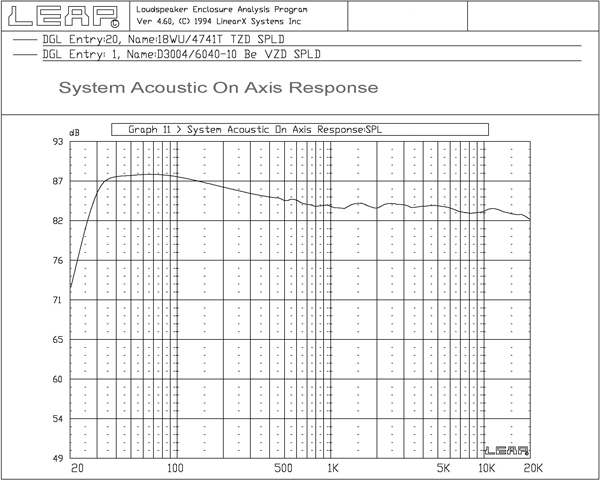 Madisound begins by taking anechoic driver response and impedance measurements and loading this data into the LEAP filter analysis program by Linearx. 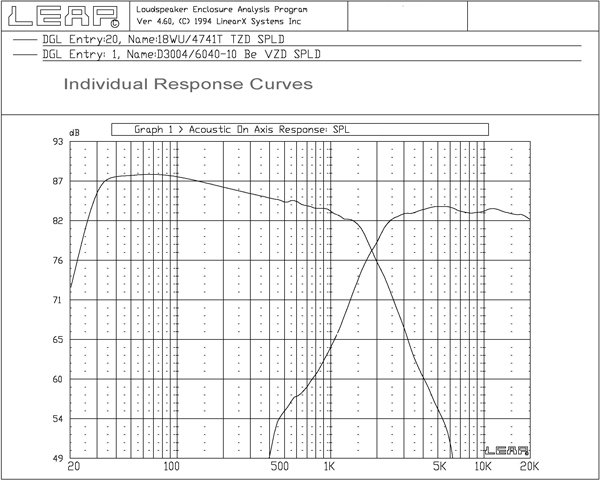 With the Leap program we can plot what would be an ideal curve for each driver, then use Leap to try different filter values against the actual driver response curves, continually selecting those parts that bring the actual curve to that of the ideal curve. We then look at the total system response curve and select parts to match the ideal system response. The typical result is a smooth and flat response curve, to the limits of the selected drivers response characteristics. Please let us know if you prefer something other than a flat response for your application (e.g. voiced for a center channel, relaxed midrange). Please note that every design is different, and we do not design specific-order crossovers. We determine what is required for the optimal acoustic response of the drivers. Most designs are 12db/octave (2nd order), 18db/octave (3rd order), or a hybrid combination of the two. Zobel impedance compensation networks, baffle step compensation, notch filters, and attenuation circuits are utilized when required. LEAP crossover design results will be emailed to you as a PDF file. We will provide you a quote for crossover parts and assembled crossovers based on your design at that time. 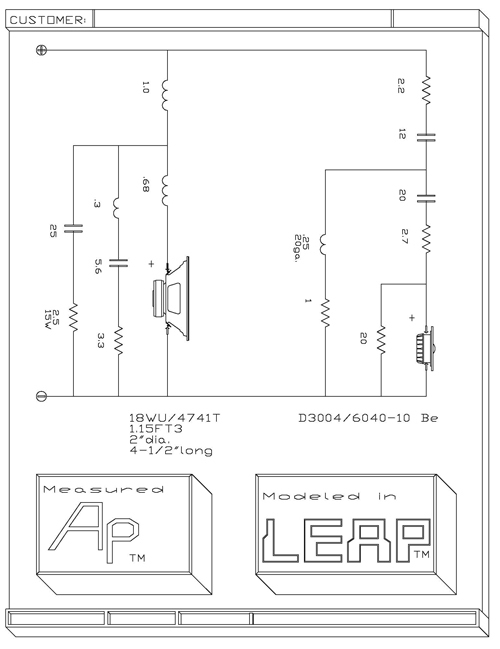 Leap designs are done in the order that they are received. The typical lead time is 1-2 two weeks, but it could be longer depending on how many designs we have in the queue. If we need more information from you about your design, Madisound will contact you once you've placed an order. Note: This service is for 2-Way (Tweeter - Midwoofer) and 2-Way MTM (Midwoofer - Tweeter - Midwoofer) passive crossover designs. We reserve the right to reject design requests based on a variety of factors. Should this occur, we will work with you on a viable alternate design or refund you in full should you prefer. Based on your LEAP design results, these can be a time saving measure. We will make recommendations based on the drivers being used and your budget. Or, you can let us know the caps, coils and resistors from our stock that you prefer. We simply charge you the cost of those parts, the circuit boards they are mounted on, and a nominal fee for assembly. You can view pictures of our assembled crossovers by viewing our DIY Speaker Kit pages. Note: If you have an existing crossover design that you would like us to build professionally assembled crossovers for, please email us the schematic and we will provide you a quote. Do you require a 2-Way TM or 2-Way MTM design? They must be Madisound stock items, or drivers we have carried/measured in the past. Enter the driver models in the text input boxes above. What is your baffle width and height? Enter dimensions in the text input boxes above. What are your box volumes? Or should we determine them for you? Sealed or ported? Enter answers in text input boxes above. Please include any further information about your project in the order “comment” section of your order at checkout. The low end lift on the bass response is a result of < 200Hz being simulated in ½ space. Simulating < 200Hz in ½ space and the resulting response gradually tilted downwards, yet flat with smooth transition between the drivers, results in a linear real world response. In our experience, modeling like this provides the best sound reproduction in a typical home listening environment. System sensitivity can be estimated by the avg db level between the 200Hz to 800Hz range. 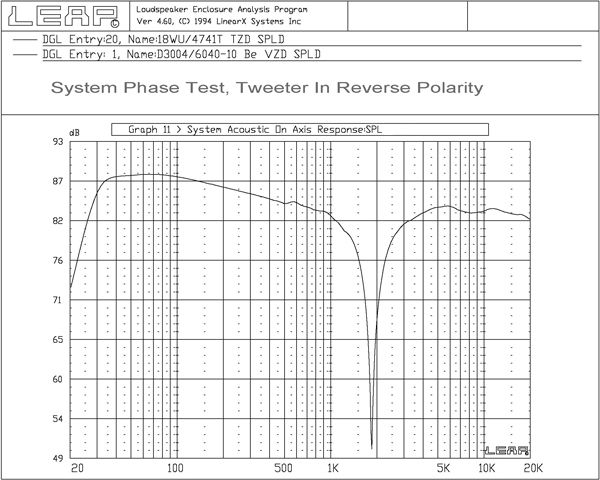 The deep and symmetrical notch, when the tweeter is connected with inverse polarity, shows that the drivers should have good phase characteristics across the crossover region. I ordered a 3 Way crossover design for use with my Tymphany NE225W 8 "subwoofer, the Tymphany NE123W 4" midrange driver, and the Morel CAT 308 Tweeter. They sent me the designs in a weeks time, and i also requested they make me a parts list of all the parts I would need for the crossover that would fit in my $350 budget and they did an excellent job. I have not assembled it yet, but I will update my review in a few weeks time. Madisound has been extremely helpful and kind and I would highly recommend their services. I found these good, decade old, Vifa woofers quite cheap locally (South Africa) and approached Madisound regarding which tweeter to use as well as purchasing a crossover design - I have no other words but absolutely AMAZING!!! In my opinion - minimal components in crossover with absolute maximum effect! I could not be happier - if you're in doubt whether or not to fork out the amount for a LEAP design, don't be - purchase with confidence. This is one of a three part review. One for this LEAP design service, one for the ScanSpeak D2608/9130 tweeter and one for the Siver Flute W17RC38-08 woofer. I had a pair of .75 cu ft MTM cabinets lying around from a years old non-finished project. I also had a pair of Silver Flute W17RC38-08 woofers not used. I decided to order another pair of the Silver Flutes and, using some old Euro tweeters assemble the speakers in a MTM design just to see what they would sound like. I crossed them over at 2 khz. They did not sound too bad at all. I am no expert at crossovers so I had Madisound do a LEAP design for the ScanSpeak tweeters and the Silver Flute woofers. Then I had them assemble the crossovers using quality parts. The original crossovers were just come basic design units I had made. Once I installed the Madisound designed and built crossovers there was an immediate improvement in sound. The speakers have a very balanced sound. Once the new crossovers were installed all I can say is wow, do these sound good. Very smooth. Vocals are astounding. I can listen to them for hours. I hear things I never heard before in my music. I do have a sub-woofer but only use it on older recordings as older recordings seem to lack bass. I highly recommend the LEAP design (and in my case, having Madisound make the crossovers). I want to thank Madisound (and Adam) for their help and guidance. I wanted a small but great speaker for my front theater system. The crossover designed and built by Madisound turned out great. This build used Scanspeak 18WU/8747 (7") and the D3004/6620000 1" fabric dome and the result is spectacular -- sounds smooth as low as it can go. Unless you like to build (and simulate or test) crossover networks leave it to Madisound and you will get the best result for the drivers you purchase. I reviewed crossover design theory and then ordered a crossover designed and built by Madisound. I had them replace electrolytic capacitors with polypropylene types so these are quite large. I think they used good judgment for component selection. They didn't skimp on the architecture of the design. I am totally satisfied with the end result. I don't hear any peaks or dips just music. Each speaker had two 26W/8861T woofers, two 12MU/8731T mid and one D3004/664000 Berillium tweeter. Shipping -- The best service ever! Small orders are shipped right away. If in doubt ask. They provide honest answers based on their experience. I've bought many parts from Madisound, but never needed to have a crossover designed from scratch. Generally I was rebuilding existing crossovers or cloning existing designs. That changed when I acquired a pair of Scan Speak 2-ways. They are complete speakers, not just drivers. Scan Speak used the 18W/8542 woofer and D2008/8512 tweeter, but used a crude crossover with one coil and one cap. I couldn't understand how such an obviously high quality set of speakers could sound so bad. After trying my best at designing my own network, I gave up, not confident enough in my own (and various online calculators) specs to spend the money to buy the various parts needed. I talked to the designers at Madisound. 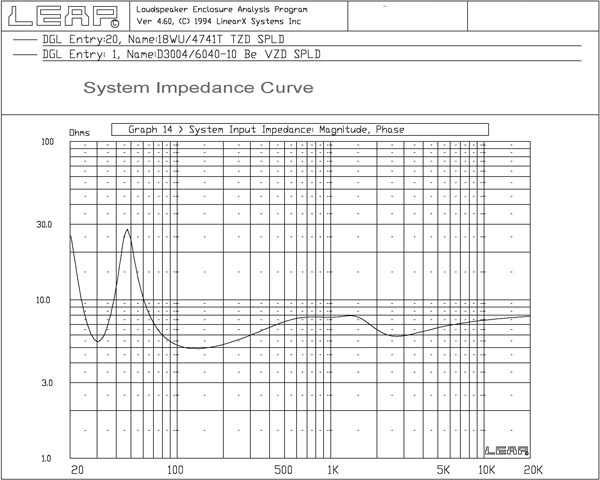 They stock the drivers used in my speakers, and were able to create a design that several anomalies in the response curves of each driver. I held my breath, bought the components and built the crossovers. Success! The Scan Speaks are now my favorite set of speakers by far. Sweet but articulate, they are the kind of speakers one could listen to for hours without fatigue. The finest imaging I've ever encountered outside of $10,000+ meg speakers at high end audio shows. So, a a big thumbs up to LEAP and Madisound!